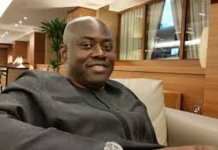 The last may not have been heard about the disrupted Presidential rally of the All Progressives Congress (APC) in Ogun State on February 11, 2019. The state is one of the strongholds of the APC in Nigeria. Apart from being contiguous to Lagos, Ogun State has produced leading lights who are prominent stalwarts of the ruling party. 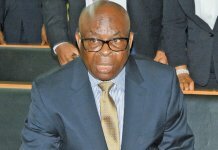 The Presidential rally, which later turned out sour, was meant to be completely an APC affair for the re-election of President Muhammadu Buhari, and to formally present the party’s gubernatorial candidate in the state, Dapo Abiodun. What actually played out could be described as a brazen display of arrogance by Governor Ibikunle Amosun who started beating the orchestrated war drum to the utter dismay of the leading figures of the party in attendance. Without mincing words, while exhibiting intolerance, and also seizing the occasion as a payback time, the governor left no one in doubt of his mission. Amosun, in concert with his advisers who are prominent members of a fringe party, Allied Peoples’ Movement (APM), had perfected plans to steal the show at the event slated for 2pm. On arrival at the MKO Abiola Stadium, Abeokuta, venue of the rally, Amosun was stunned to see that supporters of Abiodun, who were neatly clad in different yellow attires bearing the inscription ‘Dapo Abiodun for Governor’, had mounted every seat. They also had portraits, posters and flex banners of the APC governorship candidate adorning every strategic location within the main bowl of the stadium and the popular Presidential Boulevards. Surprisingly feeling distraught over the development, the governor wasted no time in ordering his aides, with the active support of his security details, to start removing all Dapo Abiodun’s Campaign materials from within and outside the stadium. When Abuja security chiefs took over the screening exercise, three hoodlums were arrested with an axe, a short knife and assorted charms found on them. Many other hoodlums were also prevented from entering the venue. The governor personally took charge and herded the APM supporters into the main bowl. The APM supporters, in their scores, chased out Abiodun supporters with sticks and took over the arena. Many of them were either injured in machete attacks while others were beaten black and blue under the direct watch of the police. Besides, musicians on hand didn’t help the situation. Apala musician, Alhaji Haruna Ishola (junior), Fuji maestro, Sefiu Alao, and hip-hop musician, Small Doctor, were singing mocking and inciting songs to harass and embarrass Abiodun and his supporters. The last straw that broke the camel’s back was the programme of event. The anchor person, Mrs. Abike Dabiri, who is an in-law to Amosun, took charge. 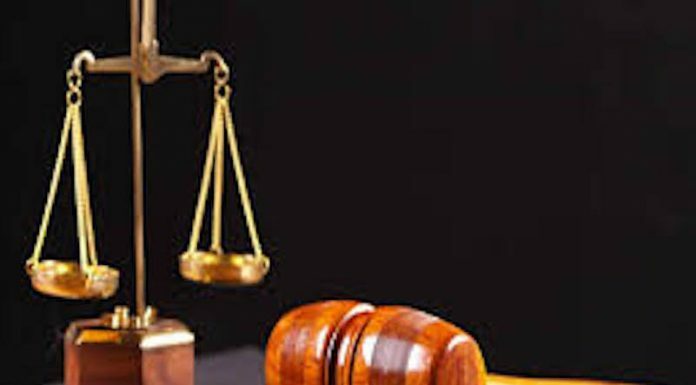 Item 7 – goodwill message – which was reserved for the Ogun State APC Chairman, Chief Yemi Sanusi, was reversed and the suspended former chairman, Chief Derin Adebiyi, was asked to handle it. In his bid to straighten the rough edges, Osun State’s former governor, Ogbeni Rauf Aregbesola, while addressing the mammoth crowd, cautioned APC’s faithfuls and supporters to be wary of hypocrites. But at this stage, the development did not go down well with the chief host, Amosun. He went overboard. He threw cautions to the wind, hopped up from his seat and engaged Aregbesola in harsh words and warned him to steer clear of Ogun State’s domestic political affairs. But the swift intervention of the governor’s wife, Olufunsho, who quickly rose to her feet and held back her husband, saved what could have been an ugly situation. Regardless, commotion started shortly after the national chairman of the APC, Comrade Adams Oshiomhole, rose to address the crowd and present the party’s flag to Abiodun. Immediately, Oshiomhole took over the microphone, it was switched off from the “mixer machine” and he couldn’t talk. Next, there were chants “Ole! Ole!! Ole!!! (thief). The national chairman had no choice but to silently hand over the party’s flag to the governorship candidate, Abiodun. One of the placard carrying members of the APM immediately hurled an empty table water plastic in the direction of Buhari and other chieftains of the APC on the high table. While calming frayed nerves, Amosun intervened and addressed supporters of the APM in Yoruba dialect, not to do anything that would embarrass the people of the state before Buhari. 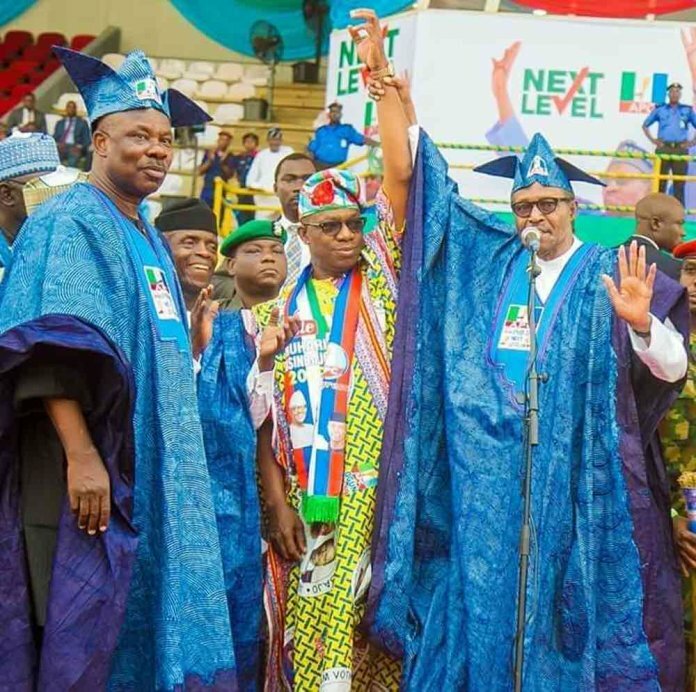 Also, the Director-General (DG), Buhari/Osinbajo Presidential Campaign Organisation, Chief Rotimi Amaechi, told the crowd that their mission was two-fold, to campaign for the re-election of President Buhari and Abiodun as the next governor of Ogun state. According to him, “We are all here completely for the APC elections. The event of today is completely for all our candidates from the Presidential, governorship, National Assembly and to the State House of Assembly. “It is important to vote for the re-election of President Muhammadu Buhari and the state governor. Let us not make any mistake otherwise we (APC) will lose it,” said Amaechi. A grapevine source hinted that no fewer than 200 hoodlums were brought into the main bowl of the stadium to embarrass Abiodun, Oshiomhole, Asiwaju Bola Ahmed, Chief Olusegun Osoba and other key figures that were against Amosun’s preferred governorship candidate, Adekunle Akinlade. However, two stalwarts of the party, Chief Bode Mustapha and Dr. Femi Majekodunmi, have condemned the fracas. Mustapha, the Bobagunwa of Egbaland, who was Director-General (DG), Amosun’s re-election in 2015, said it was a show of shame that had never happened anywhere. “It was unprecedented and extremely pathetic that President Muhammadu Buhari could be pelted with missiles of all kinds. It was shameful. I think, the party should look into it and appropriate sanctions meted out to the governor, because nobody is greater than the party. Also, Majekodunmi, who is the Baagbile of Egbaland, berated Amosun and his loyalists in APM: “It was unfortunate that Amosun and his rebels did this last week because they wanted to vent their anger on the national leaders of the party, including Buhari. That they could go to that extent was very shameful. I am sure Governor Amosun might have regretted that shameful act. “We are for the Unity of the APC and we still believe Amosun would see reason to forget whatever injustices that may have been done to him and work for the progress of the party. Many of us are concerned about the unity of the party and on how to ensure that all our candidates vying for various elective offices win in the forthcoming elections.